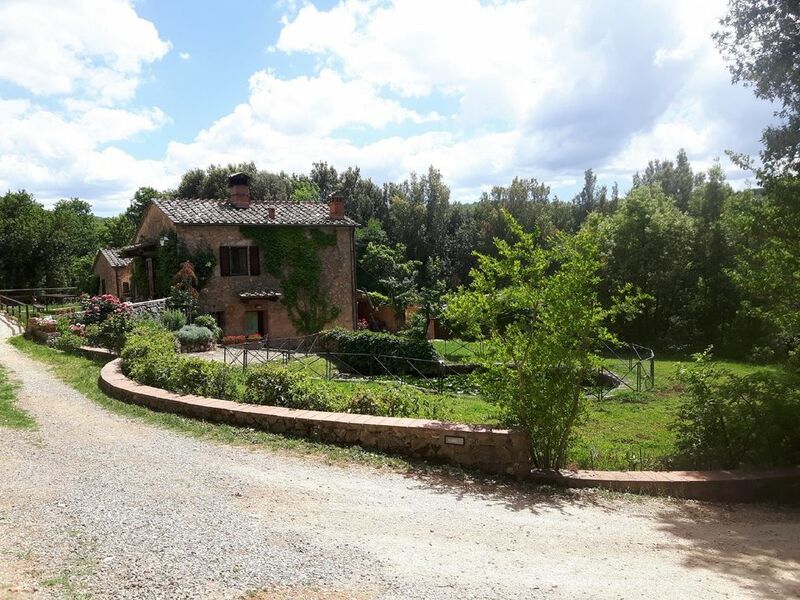 Your entire Tuscan Stone renovated Farmhouse near Siena, situated on a hillside in the middle of olive groves with fenced pool (5x10), Wi-fi and private land of 10 hectares. THE PROPERTY IS FOR YOUR EXCLUSIVE USE, IT IS NOT SHARED WITH OTHER GUESTS OR OWNERS. Possible to rent bikes, play TableTennis, BeachVolley and Soccer. Charging station for electric cars, pony and children's playground on-site! The house is divided in three apartments, which means privacy with enough space to spend time all together in the main house with fireplace, in the garden, terrace or at the pool. Apartment 'Palio' with two double bedrooms with airconditioning (one baby bed), two bathrooms, kitchen with big table, washing machine, dishwasher, microwave, coffeemachine and oven, livingroom with fireplace, tv and sofa bed for two people. Apartment 'Giallo' with one double bedroom, one bedroom with two single beds, one bathroom and kitchen/dining with tv, microwave, coffeemachine, washing machine, dishwasher and oven. Apartment 'Fienile' with two double bedrooms (one baby bed), two bathrooms, kitchen/living with tv, microwave, coffeemachine, washing machine, dishwasher and oven. Sofa bed for two people. All apartments are accessable from the groundfloor. Perfect for families with children. Fenced Pool. Podere Casetta is a family-run biological farm that produces olive oil and honey, immersed in silence and in nature surrounded by meadows and gentle slopes of oaks in the Sienese mountains (Montagnola Senese). Here you will find your true Tuscan holiday, in the middle of nature, taking sun at your private swimmingpool near to the house. We have a well-aired summer suitable for walks in the nearby woods, crossed by several paths, catching sight of charming landscapes, lots of medieval villages. It is also possible to have a walk and explore the private land of the farm, between olive trees, fruit trees and woods. You will surely enjoy this magical place during which, with a little stroke of luck, you might see fallow-deers, badgers, foxes, porcupines, hedgehoges, dormices. Our guests have acces to all the private land of the farm. Olive groves, private woods gardens and swimmingpool. From the property it is possible to have amazing walks in the surroundings. We can organize for you winery visits, guided walks (with the pony's), dinners and wine tasting at the property. We will think of everything. Just ask us for the possibilities. We truely believe it is such a magical place. We produce several biological products like Olive Oil Extravergine, Honey and Fruits. Our visitors have acces to all the private land of the farm. Olive groves, private woods gardens and swimmingpool area. Fenced Pool! Possible to rent bikes, play TableTennis, BeachVolley and Soccer. Charging station for electric cars, pony and playground on-site! We can advice you for the best restaurants, wineries and places to visit. On request: * Tuscan dinner; * Pizza evening with use of the original wood oven; * Tuscan Wine-and Food tasting with Sommelier; * Pony-ride for kids on-site; * Rent bikes; * Horse riding off-site; * Extra Cleaning. Perfect base to explore all the best of Tuscany.Siena - 18 km/11 miles, Florence (75 km), San Gimignano (35 km), Volterra (39 km), Monterigioni (25 km), San Galgano (30 km), Casole d'Elsa (16 km), Colle di Val d'Elsa (25 km), Grosseto - beach (78 km). Not included in rental price. In apartment 1 and outside big tables with enough seats for 16 people. Patio plus gazebo with big table, light and pizza oven. View of the garden, hills and the woods. The nearest big and well known golf club is at 20 km distance from the house. The farmhouse is magnificent! It is basically 3 apartments together. The home has been completely updated, so all the rooms, baths, and kitchens were modern and luxurious. There are 3 full kitchens! The separate apartments allowed some in the group to have some private space, but the property was very well suited to a large group enjoying the space together (we were a group of 5, but the property would also be great for a larger group). The property is beautiful and quiet with lovely outside eating/sitting areas. You get a real feeling that you are in Tuscany - the design and decoration create a wonderful atmosphere. The entire farmhouse is extremely clean and perfectly maintained. The owner was wonderful to work with. Our only minor point is that a clothes dryer would be a great addition. We had a magical stay! We had here at Podere Casetta such a wonderful week! A lovely place, so peaceful and in the middle of true Tuscan Nature. The house has the most beautiful antique Tuscan elements but with all comfort that you need. The kitchens are really well equipped! Pool was great and there are lots of different spaces for eating outside. We had a great stay and I would highly recommend! Nous étions 5 familles à nous partager les lieux (grands-parents, enfants et petits-enfants), et l'endroit a juste été parfait pour nous ! La maison a autant de lieux de rencontre que de lieux où chacun peut s'isoler s'il le désire. Pour les enfants, la piscine, les alentours avec place de jeux et de football et plein de recoins à explorer. De plus, la maison est située à proximité de beaux sites touristiques (Sienne, San Gimignano, Volterra,...). Nous avons aussi apprécié les conseils données par notre hôtesse : restaurants, visites, lieux pour les familles, ainsi que son amabilité et disponibilité. Je conseille vivement l'endroit ! We will be really happy to advice our guests which places are worth it to visit and which are the best restaurants of the area. Perfect base to visit all the important towns of Toscany. Siena - 18 km/11 miles, Florence (75 km), San Gimignano (35 km), Volterra (39 km), Monterigioni (25 km), San Galgano (30 km), Casole d'Elsa (16 km), Colle di Val d'Elsa (25 km), Grosseto - beach (78 km).